For Catholics, making the sign of the cross is second nature. We do it upon entering and exiting a church, during Mass and at home before and after prayers. For me, growing up, it was even a custom on my dad’s side of the family to make the sign of the cross on each of my relative’s foreheads upon greeting them at a family gathering. And I have since passed on that very tradition to my own family. Making the sign of the cross is so important and powerful for many reasons. It reminds us that the true cross is an instrument of our salvation and that through our baptism, we belong to Christ. It is a spiritual weapon that can ward off Satan or assist in quelling any temptations we may be experiencing. But most important, it is an outward sign of our internal convictions that draws us nearer to the one true cross of our Lord and Savior. There is an upcoming feast day which commemorates the discovery of the true cross. The feast of the Exaltation of the Holy Cross, celebrated Sept. 14, marks a series of historical events that all unfolded in the early fourth century. According to legend, St. Helena, Emperor Constantine’s mother, set out on a pilgrimage to Jerusalem to find the true cross of Christ’s crucifixion. Upon finding it, St. Helena had a church built on this site (also the location of Jesus’ tomb), the Church of the Holy Sepulchre. Her son Constantine dedicated it in the year 335 A.D. There are many miracles and legends that surround the finding of the Holy Cross. One such legend has it that St. Helena had been praying and searching for days and then noticed a sweet-smelling aroma of green basil growing on a hillside. She gave instructions for her attendants to dig in that area, and then discovered the cross on which Jesus was crucified. I learned this story some time ago. Now, when I encounter basil in the garden, or feature it in a meal, I ponder its role in the finding of the true cross. There is no way to know if this legend is true. But if the fragrance of fresh basil brings one’s mind to the cross, it cannot hurt to perpetuate the story! So gather some of this sweet, aromatic herb and a few other ingredients and mark Sept. 14 as the day that will point us to the direction of the true cross of Christ. And may it also help us to remember that when we make the sign of the cross, we do so mindfully and give our entire self to God. Preheat oven to 425 degrees. For the pesto, combine basil leaves, pine nuts and garlic in a food processor and process until minced. Slowly drizzle in the oil, followed by the lemon juice, and process for another 5-7 seconds. Add the cheese and pulse just enough to combine (you may have to scrape down sides with a rubber spatula). Transfer the pesto mixture to a small bowl. Add the chopped green onions and salt and pepper. Mix until combined. 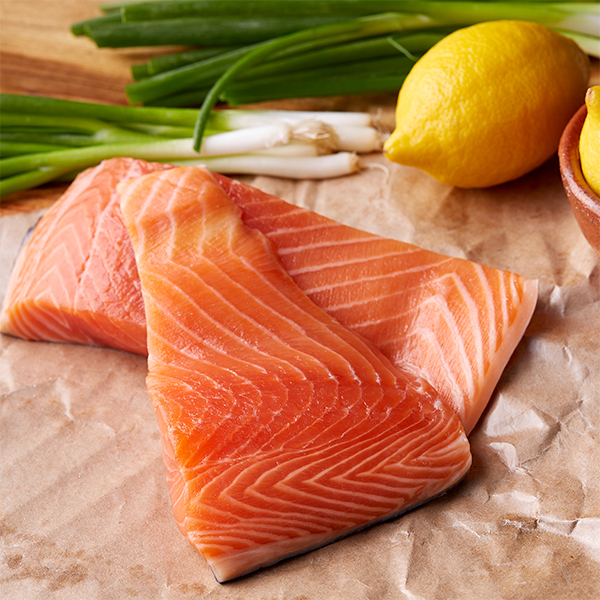 On a baking dish coated with cooking spray, place salmon filets (skin side down). Spoon and spread half of the pesto mixture over the fish. Bake for 10 minutes and then baste (with a brush) remaining mixture over fish. Bake for an additional 2-3 minutes or until fish flakes with a fork. Serve with additional lemon wedges. This same recipe is excellent grilled!